Jason graduated in 2003 from Columbus State in Ohio with an Associates of Applied Science Degree. He passed his board examination in June 2003 and has been in the emergency field ever since. 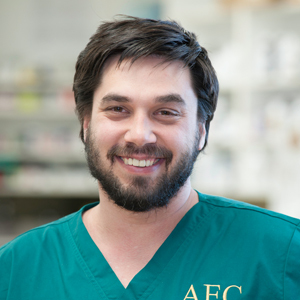 Jason has also supplemented his emergency experience with occasional general veterinary practice work to become a very well rounded and caring technician! Jason first realized he wanted to become a veterinary technician when he was in the first grade - his family took their dog to the vet and he was intrigued by all of the things he saw the technician do with their pet. Along with his experience and strong work ethic, Jason brings a love for animals and a positive attitude to AEC. "The best thing about emergency medicine is that no case is exactly alike. I am constantly learning new things." Jason is a very family oriented and loving husband with two sweet little girls and a five year old black lab named Luna. Jason's pets have always been considered his four legged children!